It's just a story we tell ourselves for why we can't achieve the dreams we see for ourselves. It's normal if you don't believe what we are saying. That's why we want to introduce you today to Sara Mehandzieva, Co-Founder of Forstep Style, a progressive online fashion products marketplace. Together with Igor Dimitrov, another of the founder they have built the marketplace from scratch. It is built around the idea that if given the right audience any hard working individual can become successful. Which matches very closely with our philosophy which is “if given the right tool any person with the right mindset can be successful”. And we are proud to be a part her journey with our product Dokan. This is the e-commerce success story of Forstep Style. Unlike some of the most popular e-commerce platforms out there like Amazon, Alibaba etc., Forstep Style's primary goal for the future is not to sell everything. Unlike other multivendor marketplaces such as Amazon, eBay, Ali Express or Tictail that sells everything, like furniture, cars & gadgets, we have a core focus on fashion only businesses, aiming to build Forstep Style as the best online shopping mall for all fashion lovers out there. And that's not a bad idea at all. Some of the biggest online marketplaces started by focusing on something niche. It is also one of the easiest marketplaces to get started with as they do not take any charge to sell your products. They even throw in a no monthly fees policy (literally) + personal shop assistant for free. Sweet, right! We really liked the solution Sara came up with for the eCommerce problems that many people face. We solve a lot of e-commerce problems – especially the “just getting started” part. The Easiest Marketplace For Sellers, PERIOD! Vendors can get started completely risk-free. No listing and subscription fees are required when vendors sign up to sell their products. Forstep Style charges them only when they make a successful sale. Which is awesome. It is extremely easy to understand how to create a store in Forstep Style. Vendors who sign up will get a personal shop assistant for FREE which is really helpful for the beginners who are just starting out. And the grandest of them all, Forstep Style will promote the products of the vendor for completely FREE on Instagram, Facebook or Pinterest. It doesn't get any better than this. 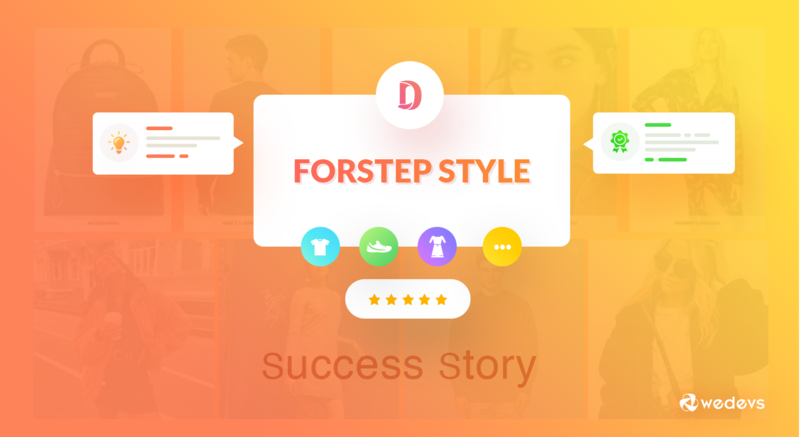 Forstep Style mainly emphases on the sale of shoes, bags, accessories, cosmetics, jewelry, and clothes that are brand new, unworn or made to order. Buyers purchase directly from the seller (the buyers are usually based in Europe or UK) and the website receives its fee from the transaction that happens between the two parties. These fees are only 15% of the product price, and that’s it. The vendors don't need to pay anything else because there are no monthly listing and subscription fees. Someone who is looking to buy can come to the site and access many different items that are owned & stocked by sellers directly from their own separate store page. Items are organized by specific fashion categories and can be accessed anytime by the customer. There is even a separate search bar for easier product finding. In Forstep Style there are 25+ categories products to choose from that help the customers find what they are looking for. And help the vendors organize their listings much more easily. Forstep Style's superb policy lets vendor set up a storefront all for free. And even provide them customization options to match it to their brand guideline. Because most of the vendors are still in their early stages, they need to let customers know a clear image of their brand. Along with a completely separate store page, the vendor gets a unique URL similar to “https://forstepstyle.com/storename”. Which they can use in other places and for other purposes too. Vendors can also add their business social media channels right in their store page to acquire more customers. By using Dokan Forstep Style can provide their vendors to optimize their own store SEO too. Listing up the product is an extremely simple process too as everything happens from one easy to understand vendor dashboard. When adding a product, vendors will be able to add to images and descriptions for that specific listing. In Forstep Style vendor can list up to 50 products per shop. What made Sara choose Dokan? When Sara started building their marketplace Forstep Style 1 year ago (in the earliest days of the venture), they saw that Dokan is one of the most popular WordPress-friendly plugins in the multivendor e-commerce business community. Whether you’re running an online marketplace like Upwork or online fashion marketplace like ours, Dokan is a powerful tool that can help you make your marketplace rich with functionalities, yet simple and easy to manage from vendor perspective. Which Sara thinks is one of the main factors, that have made them successful in such a short period of time. Gathering many positive reviews from both, sellers and customers combined. Sara has given the example of the vendor dashboard. On the left side of the dashboard, vendors are able to hover over any section they might need in an instant, like view orders, products, coupons, store support, reports, reviews, shipping settings, store SEO and so much more! Apart from that, Forstep Style’s vendor's sign up process is also straightforward and simple. Vendors only need to submit a shop name, email address, and at least a single product. To get listed when they first set up their account. Create an Account→ Upload Product Listings→ Shipping→Payment Options→Billing. How customers are experiencing Dokan? I really love the dashboard interface. Simple and nice designed. Also, you have many rich functionalities and they are all at one place. I am very satisfied with your seller technical support center as they helped me out a lot when getting started with selling on Forstep Style. As for customer perspective, they really love the website interface design. As everything is very intuitive and easy to find, especially when shopping from mobile. If this story inspired you to go after own entrepreneurial dream and make it real go for it. And always feel free to check out the affordable pricing of Dokan Pro. ← The Biggest WordCamp Giveaway at WordCamp Ahmedabad 2018!